Serafina Loves | Live. Learn. Love. Eat. I knew that it would be an adventure to feed my baby. Not only because we are vegan, but because we also don’t eat sugar or white flour and I like to feed my family as natural as possible. When I went to the grocery store to look at the different baby foods they sold, I was actually shocked at the list of ingredients in baby cereal. Among some unpronounceables, there was also dry skim milk and sugar. I figured that a baby does not need to eat that, so I decided to just make my own cereal. 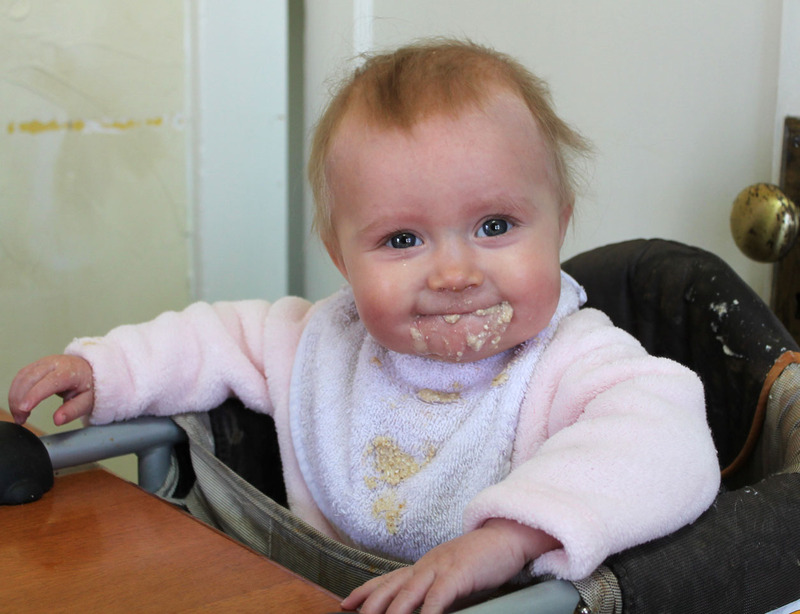 I make rice cereal for Serafina by using brown rice flour and breast milk and add fruit puree. I also make oatmeal cereal too by grinding oats in the food processor into oat flour and adding milk and/or pureed fruit. As far as fruits and veggies go, I have made some of my own, but have mostly just been buying organic jarred baby food. It seems to be a lot cheaper to just buy the food and time saving as well. I do so much already from scratch that this is what works best for now. When Serafina is a little older and eating more things I plan to puree up whatever we are eating for dinner and giving her that. Things like soups or lentils etc. Here are a few things that Serafina is loving these days. 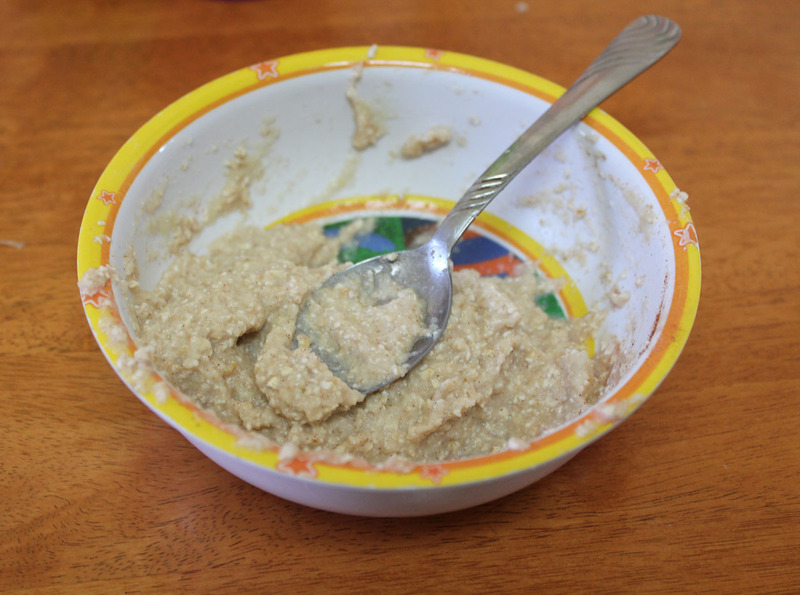 I make my own oatmeal cereal by grinding quick oats in a food processor until they are the consistency of oat flour. I then just add some fruit puree to the oat flour and a little bit of breast milk or water to thin it out. She loves this! Sometimes I even make it with applesauce and add a tiny bit of cinnamon to it to make apple cinnamon oatmeal. Even I think that it is delicious! Another thing that she is loving and that we have been totally into these days is banana soft serve. Frozen bananas processed in a food processor until smooth with a few tablespoons of water. I forgot how utterly delicious this is. 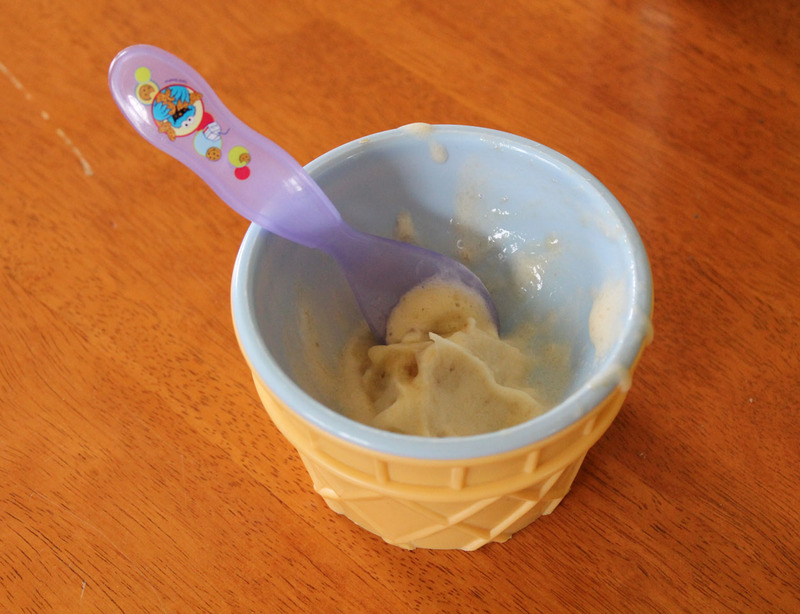 We call it banana ice cream and the girls even love to have it with their toast or muffins in the morning. This morning I made a nice big bowl for myself and added sliced bananas and cinnamon to it. Kesa likes hers made with cocoa powder so that it is chocolate flavored. You can also add strawberries to it as well to make strawberry banana ice cream. I am extremely addicted to this these days. It feels like such a treat that I almost feel guilty for eating a huge bowl, but it is just bananas! One other thing I made lately was prune puree. I have been wanting to try prune puree in baking in place of oil and/or maple syrup to make things even more healthy. 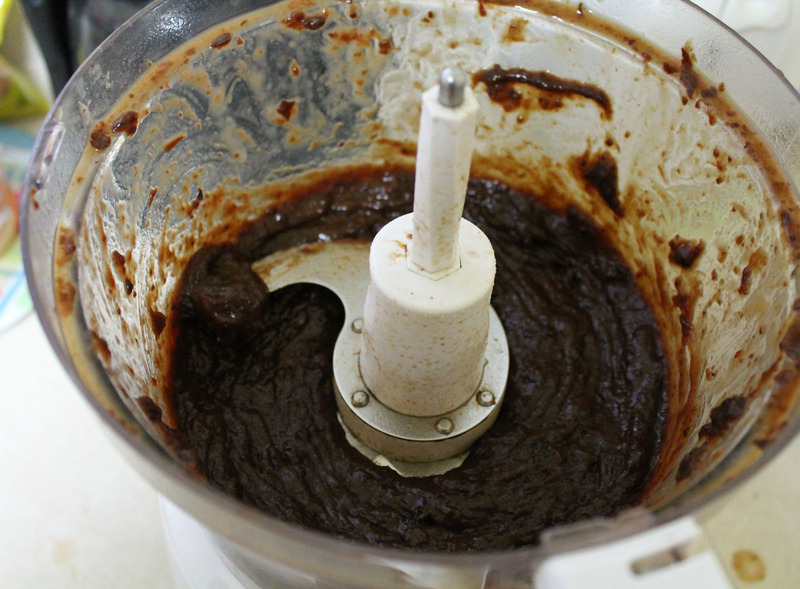 Tonight I made prune puree by placing one cup of pitted prunes + 2/3 cup boiling water together in a food processor and blending it until it was smooth. I love prunes and pretty much all dried fruit to snack on, so I loved this too. The first time I made it pretty thick so I made a second batch that was thinner (which is the above recipe). The prune puree will keep well in the fridge for 1 week. In other news, I have been having really bad karma lately with my left hand. On Friday I sliced my thumb really bad while cutting watermelon for the girls, right through the nail and lost about 1/3 of my thumb nail. It was sliced right near the cuticle so I had to peel the nail right off. The top part of the thumb was sliced fairly deep as well. 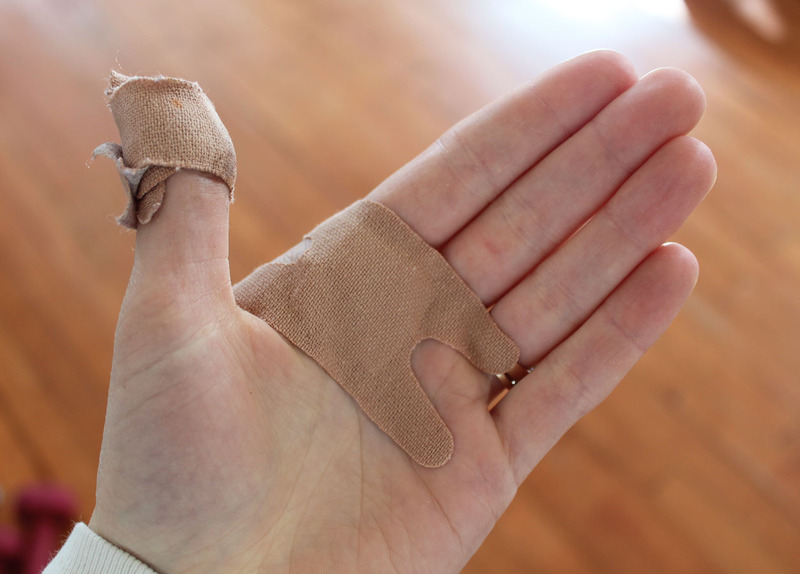 Then, on Sunday I stabbed my hand while attempting to remove the pit of my avocado with a knife (bad idea). The knife slipped and I stabbed myself. I am not sure what this all means, but I haven’t been able to get my hands wet so hubby has been doing the dishes for me and the girls are in desperate need of getting their hair washed. It was interesting enough washing my own with one hand. Still, nothing seems to slow me down. I am still baking and exercising as usual, though we have been spending more time reading books again too. 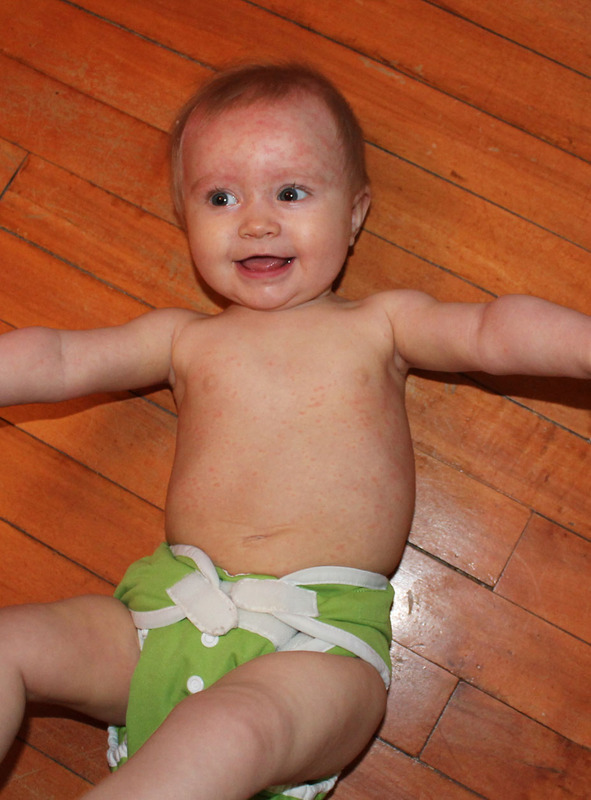 Serafina also woke up this morning with a bad rash. At first I thought it was an allergy, but we took her to the doctor and they said it was caused by a viral infection, which should just clear up on its own. She is still as smiley as ever though. So that is where my life is at. I wish that I had more time to blog, but life just never seems to give me more time. I have so many ideas that I never get out. Plus, I just love to write, especially for my own sanity. Weeks keep flying on by and I honestly do not know where the time goes. Ouch! You and Serafina heal up quickly! So proud of you! You’re such a great mom! I just found your blog and it’s amazing. I have been searching for vegan but without the white sugar and refined flour is very difficult. You have Great recipes for my kids. Thank you so much! About your daughters rash my 2year old son also had the same. The doctor also said its just a virus and nothing to worry.